Our Ohana studio is sparkling clean & features tropical furnishings with private entrance, private bath & private lanai. Kitchenette includes fridge, microwave, sink, coffee maker, kettle toaster, blender, hot plate and rice cooker. All dishes, silverware, towels, linens, shampoo, conditioner & body wash are included for your use. Private bathroom with tub & shower is inside the unit. The lanai is private, great for relaxing, drinking your morning coffee (included) or having cocktails and/or candle lit dinner. View from your lanai is a beautiful fountain, pond, garden and seating area, all for your use. The studio is fully furnished with comfy queen sized bed, table and chairs, desk, dish TV, DVD player with DVDs, CDs, books and outdoor BBQ with burner. Common carport has washer & dryer for your use. Snorkel gear, boogie board, beach chairs, cooler and towels are also included. We are on one acre of land. We have our own separate living area, on the opposite side of the carport. 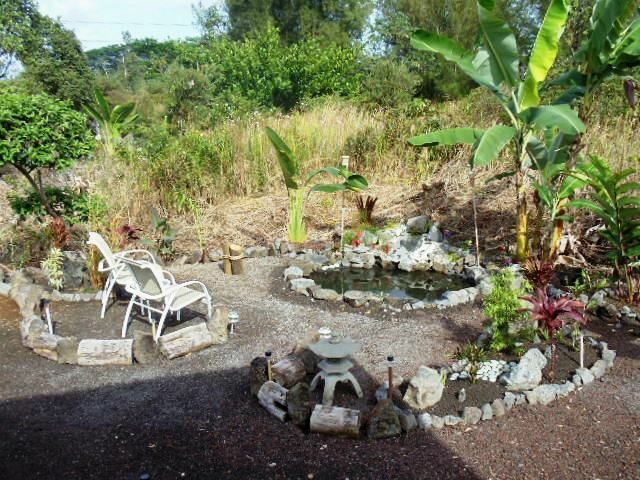 Property is landscaped with many beautiful plants, fruit trees, tiki torches, fountain and pond. We are 20 minutes south of Hilo, 10-15 minutes from shops, restaurants, grocery store and Olympic sized swimming pool. We are approx 1/2 mile from the ocean cliffs. Isaac Hale beack park is approx 20 minutes away. Volcanoes National Park is a 40 minute drive. Kehena Black Sand Beach (clothing optional), where you can swim with the dolphins, is 25 minutes away. We are 15 minutes from the and Uncle Robert's. Sunday Makuu market is 10 minutes. We are centrally located for side trips to all other parts of the Big Island. $59/night for 2-6 nights, 7th night is free! $354 a week/ for 1-2 people. (7th night is free)! Ask about longer term rates!! No smoking in the unit, on the lanai or on the property. I am a Real estate agent with REMAX Properties. I was born here, raised on the east coast and have been back in Hawaii for 28 years. We enjoy outdoor activities, nature, gardening, snorkeling and the ocean. This is the perfect place to enjoy them all! We chose this section of the island because of the sunny weather in this area. We get more sunshine and less rain than Hilo, yet we are only 25 minutes away. We are only ½ mile from the ocean so you can walk there and also hear the crashing surf most of the time. We have one acre of land and love to garden and grow food. I love it here! Lots of things to see and do. Our unit is clean, comfortable, relaxing, and very well appointed. We enjoy some of the freshest air in the world. There are many things that are not in the guide books and we are happy to share our first hand knowledge of the area with our guests. Kitchenette with under the counter fridge & freezer, microwave, toaster, blender, rice cooker, (electric fry pan available upon request). Dining is on your own lanai. Very good accommodation for the price. Everything was spotless, (except under the bed does need vacuuming- very minor complaint. I only realized this because I had something fall behind my pillow.) The bathroom, most importantly, was EXTREMELY clean. No ac but it was not needed. (We stayed in March, plus there is a fan.) Decor is as pictured, not new or fancy but very "Hawaii" and attractive. Pretty spacious. There was a bit of noise from the wildlife outside (frogs, birds) but you are in the tropics so it's to be expected. I was able to sleep fine anyway. The host was very kind and welcoming. We were a day late due to flight delays, and she offered to let us stay another night since the place was not booked. Location was good for sight seeing. Comfortable stay overall. Great studio. Personable host available for tips on what to see nearby. Very clean and nicely furnished with everything needed plus a private lanai. Quiet and relaxing after a day out sightseeing. Close to great restaurants, and grocery stores. About 25 miles from Volcano park and an easy short drive to Hilo and the airport. I would definately stay again! The Dolphin Hideaway was an exceptionally clean and nice accommodation. The host was very attentive to our needs. A nice quiet location where you can hear the birds and the faint sound of the surf a short distance away. A short distance south is Uncle Roberts night market and in the opposite direction was Hilo. Don’t forget to visit the Suisan fish market in Hilo. Then north of Hilo are waterfalls, botanical gardens and awesome coastal scenery. Quiet peaceful location that had a nice central location for both north and south sightseeing. Shopping 15 min to town. Clean accomodations with everything you would need. Laura was a great hostess. Fantastic, perfect location and host! Fantastic location and host! Beautiful. Quiet, yet close to town. Laura thought of everything you might need while on vacation. Most comfortable bed, beach towels , chairs, umbrellas, scuba diving equipment,coolers. The cottage is immaculate. She worked hard to give you the real flavors of hawaii, beautiful gardens, wild orchids growing outside your windows and gorgeous sunrise. Definitely reccomend this slice of paradise! So glad you had a great experience! Thank you so much. We try to help our guests have a great experience. Laura was a great host and the unit had all you would need on the go. She paid attention to the little details like 2 ply toilet paper and basic condiments. Her property is also well manicured in a quiet area. Thank you so much for the great review. We strive to make sure our guests have everything they need for their stay in Paradise. Please come back again and send your friends, neighbors and co workers. Olympic sized swimming pool in Pahoa. We are approx 1/2 mile from the ocean cliffs. The hot ponds, parks and beaches are nearby. Kehena Black Sand Beach (clothing optional), where you can sometimes swim with the dolphins, 20 minutes away. We are centrally located for side trips to all other parts of the Big Island. Easier way to view the rates: -$59.00 a night for 2 to 6 nights (7th night is free) -7 nights is $354.00 (7th night is free) Call or email to request our longer term rates All prices include all taxes and cleaning fees.